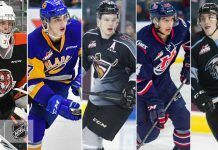 (ISN) – The Saskatoon Blades have called up forward Brayden Uhrich and defenceman Mackenzie Dwyer. The 1997 born Uhrich is the younger brother of Blades forward Josh Uhrich, and has played one game earlier this season with the Blades. He provides a gritty, energetic style and is not afraid to play a physical game. The 1997 born Dwyer is a product of Winnipeg, and plays for the Portage Terriers of the MJHL. The two are expected to play in Friday nights game in Swift Current when the Blades take on the Broncos.